There's a big heist in Den of Thieves — mainly, how much the movie steals from the Michael Mann classic Heat. It borrows greedily from another well-known genre picture, but to say which one would spoil the modest pleasures of watching Den of Thieves. Those pleasures, by the way, include its brazen theft of famous movies. 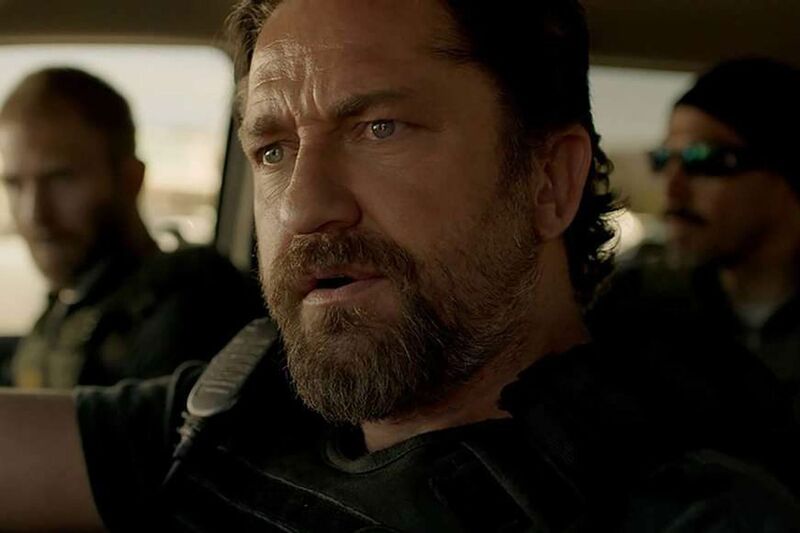 Den of Thieves makes no attempt to disguise its invocations of Heat, and in fact it invites the audience to having fun checking off the many individual nods to Mann's well-known film — sort of a movie bro equivalent to a Sound of Music sing-along. The basic structure is the same: A highly efficient, highly motivated, and well-trained group of heist specialists (led by Pablo Schreiber) is shadowed and surveilled by a mirror-image group of law enforcement officers (headed by Gerard Butler). Writer-director Christian Gudegast (he wrote Butler's London Has Fallen) adds a wrinkle or two — like the fact that Butler's lead investigator has few moral or legal boundaries. His taste for booze, strippers, and civil rights violations has him in trouble with his wife (the movie's most ill-judged scenes) and with the local head of the FBI. He abducts a member (O'Shea Jackson Jr.) of the robbery crew and blackmails him into becoming an informant, under penalty of death. As he explains to Jackson's character, "We are the bad guys." Heat drew psychological parallels between cop and criminal. Den of Thieves blurs the line completely. And while the movie's missing the meta-kick of seeing Al Pacino square off against Robert De Niro, Gudegast uses the unpredictable nature of Butler's rogue cop to escalate the level of gamesmanship between the cop and his criminal adversary. Along the way, we enjoy the Heat beats — the action prologue with the hair-trigger mishap, the two crews out to a fancy dinner, the criminals photographing the cops, etc. Composer Cliff Martinez even borrows the tick-tock percussion that accompanies the Big Heist at the movie's conclusion. The robbery itself is well-plotted, and it's not revealing too much to say that it sets the stage for an epic broad-daylight shoot-out that is Heat's big action calling card — body armor, heavy weapons, bullets flying out in the street. In what my be the movie's funniest in-joke, the motorists who see the cops and criminals pulling weapons have also seen Heat: They get the heck out of the way. Still, you have a right to wonder: What is the point of remaking a movie that has already been done to near perfection? The answer is that Gudegast is using the Heat homage the way a magician uses a flourish — to distract you from the other story he's telling. I confess to getting a kick out of watching it play out. I got less of a kick out of the 140-minute running time. Heat was two and a half hours long, but this is taking homage way too far. Directed by: Christian Gudegast. With Gerard Butler, Pablo Schreiber, O'Shea Jackson Jr., 50 Cent, Brian Van Holt, and Evan Jones. Distributed by STX Entertainment. Running time: 2 hours, 20 min. Parents guide: R (violence). Playing at: Area theaters.